It’s clear that flat design has gained great popularity in recent years. This is hardly surprising as flat design brings quite a few artistic and even technical advantages. If you have embraced flat design as a concept, then you are very likely always looking for tasteful new flat resources to use in your designs. You're in luck! That's exactly what we're going to deliver today. The icons I'm going to present today are predominantly minimal with clean draw and no-frills. Most of the icons here are UI-oriented but there are also some general icon sets. In this series we'll offer you a selection of some social icons, computer and general tech, as well as shopping, money, and ecommerce ones, though not all of them will be flat. I presume most of you do it anyway but I think it won't hurt to remind you once more: As with any freebies, before you use them, especially in a commercial projects, read the license – just in case. It's quite possible some of the icons were free when I included them in the article but the license changed after that. It’s always better to be safe than sorry – just double-check that license. After these necessary clarifications, let's move to the icon sets themselves. No matter what kind of sites/applications you design, some basic UI icons are always welcome. This icon set offers more than 50 vector icons for common UI elements, such as Home, Search, Cancel, basic navigation, etc. 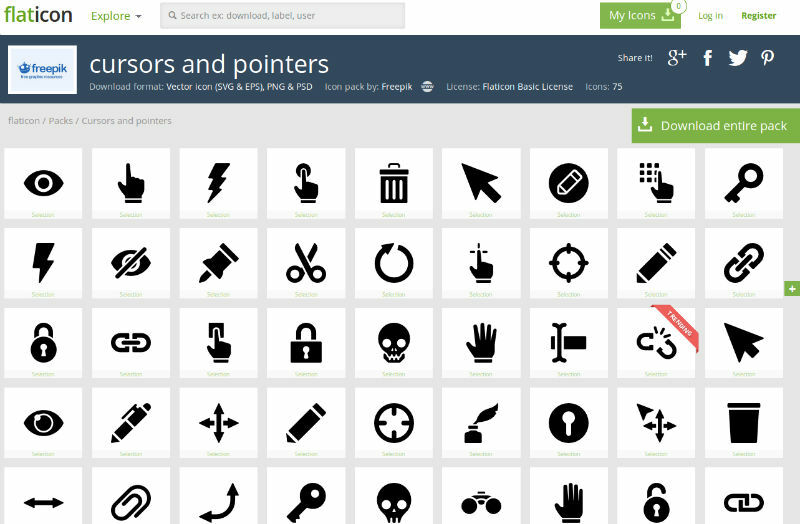 The pack contains SVG, EPS, PSD, and PNG versions of the icons. Since the icons in the first pack are just the very basic ones, in addition to them, you will most likely need more UI icons. Here is another vector pack with more than 100 icons in it. Once again, the pack comes with SVG, EPS, PSD, and PNG versions of the icons. These icons are very basic with absolutely no frills but since they are vectors, if you really need to add a little 'sizzle', they are easy to edit. While the previous two collections were black and white, this one comes in more color. This pack of elegant flat icons provide icons in many niches. In fact, there are 192 icons but they come in two versions – a color version and a black and white version. As for file formats, you can't complain either – the pack is available in AI, EPS, PDF, and PNG (64px and 128px) formats. It's quite possible the previous packs of general vector icons have all the icons you need (and more) but since one can never have too many free resources in his or her design box, here are some more general vector icons. This is the biggest pack – 140+ icons and it contains more objects, such as icons for an attachment, lock, diagram, pie charts and many more. It's available in SVG, EPS, PSD, and PNG formats, which once again means you can edit the icons as you please. With this set we are back to ‘flatland’ with this collection based on a circular motif. What I think is particularly special about these icons is that you can customize them right on the site. There are 119 icons in the pack but with the limitless customization options offered, you can generate as many variations as you want. One of the other nice touches of this icon set is that all the icons are sensibly named. Unfortunately there are too many packages where icons have no names and you have to guess. True, in some cases it might be self-apparent, but in many cases it's hard to be sure without a label. 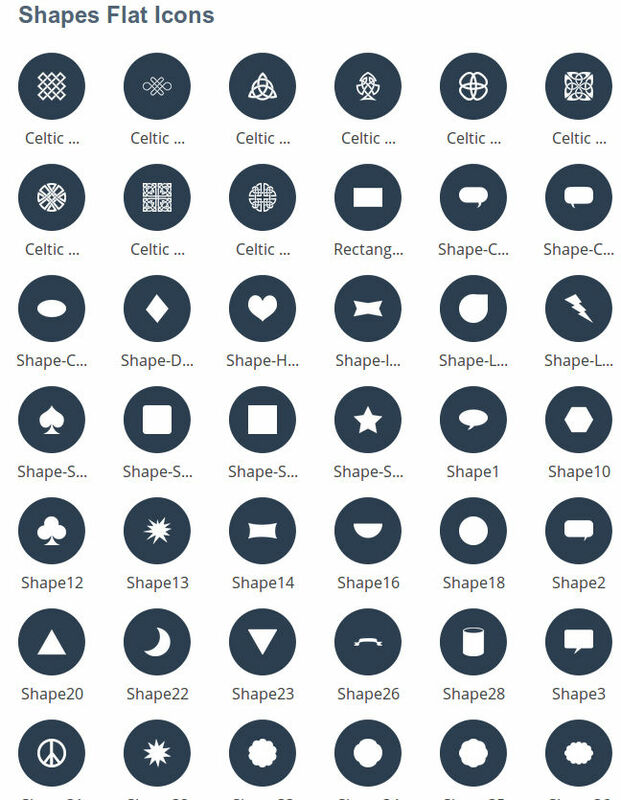 If you need icons for various shapes, you may want to check this pack. It contains lots of common and not so common shapes, such as various celtic knots, geometric shapes, hearts, flowers, swirls, etc. There are 82 fully customizable icons but, unlike the previous set, many of the shapes don't have descriptive names so there is some guessing involved. It's probably not deal-breaker, but labels are nice. There is hardly a designer who doesn't need as many cursors and pointers icons as he or she can get. This pack of 70+ free icons in SVG, EPS, PSD, and PNG isn't exactly the largest selection you'll find, but it does offer a lot of icons you can use 'as-is' or as a foundation to design your own pointers and cursors. I can think of a handfull of cursors I couldn't find in the pack, but the pack is rich and nicely finished. If you are designing extensive mobile sites or applications, this pack of 80+ phone icons may not suffice, but if you just need a tasty selection of phone icons for your Web designs, then this icon set is a good start. The pack contains vector icons of smartphones, landlines, broadcasting and miscellaneous telecom objects. If you are looking for more mobile icons, check this article where you will find tons of icons for Android, iOS, and Windows. This pack of contact icons includes round icons for email, chat, text, home, smartphone, message, notes and other similar ways to contact. The icons are 2 color but since this is a vector set, you could easily recolor them if required. The pack comes in two versions – a $5 commercial license and a free version (which requires attribution). The choice of social icons – flat or otherwise – is really huge. However, if you are just looking for simple, minimal, flat social icons, your options are narrowed. I really like this simple, minimal, flat pack of social icons from Vecteezy. The set contains 12 icons of the most popular social services. Each icon comes in a square, rounded, and circle flat varieties. The pack is available in EPS and PNG (32×32 with a 16×16 centered icon placement). So, there you have it — 10 diverse flat icon sets for your next project. And as I mentioned in the beginning of the article, I'll be rounding up some of my favorite icons sets based around particular themes in the weeks ahead, so stay tuned. @simdragon90 Might wanna check a look at these icon sets...nice images here.